DH & I have a simple rule: Satuday-night = Date-night. A few weekends ago we managed to stick to our rule for the first time in ages. We went to the Cinema and saw “Batman: The Dark Knight”. Knowing what we know about Heath Ledger’s untimely demise (what do we know?) it was disconcerting to hear him say his lines – they are so dark, so full of despair. It’s hard not to imagine that he didn’t leave the role behind him after the cameras stopped rolling. “Batman: The Dark Knight” fails. Despite all that, the film is not without merit. It’s full of excitement and tension, though it suffers from a lack of brevity. All in all, I preferred Batman Returns. Christian Bale doesn’t disappoint, of course, but he’s nowhere near as exciting as The Real Thing… (No! I’m not talking about Val Kilmer – Please!) Yup, at the begining of the summer we had a Close Encounted of the Bat Kind. One evening, at bedtime, DH noticed an UFO – in our bedroom. Bigger than a moth and quieter than a bird, something was circling the light. I was no help, what-so-ever, in identifying what it was. I was busy keeping my head buried under the duvet. As suddenly as it appeared, it was gone. DH eventually tracked it down, hiding in a crevice in the kids’ room. We got them up out of their beds, opened the windows of their bedroom, closed the door and hoped for the best in the morning. The next day, there was no sign of any wildlife making a bid for captivity and I breathed a sigh of relief. Until the afternoon when something silent and fluttery appeared again, this time in the kitchen, as if out of nowhere. Naturally, DD had a play-date over at the time. Naturally, everyone was in the kitchen at the time. Naturally, no-one can cope with nature at close quarters. Trying to keep the expletives to a minimum, I hussled the kids out of the kitchen and attempted to appear calm, for their sakes. 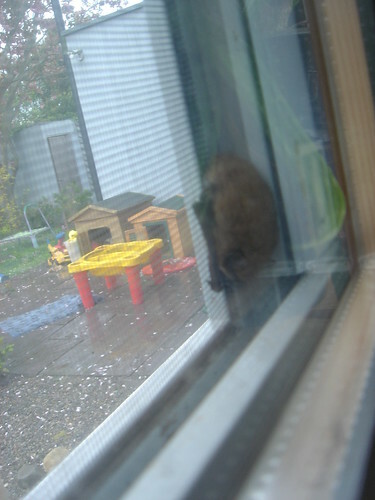 Meanwhile, the bat decided to take a nose dive at our open window. Unfortunately, for him, we have insect screens on our kitchen windows. Knowing that there would be space for him, between the screen and the pane, I closed the window. Not having him fluttering frantically around the house gave me a chance to think. Oh yes, I think that’s me! I quickly dialed the BatPhone and got talking to Batwoman, herself: an amazing woman who seems to have dedicated her life, and those of her family, to doing all in her power to help the Bats of Ireland . She talked me through what was happening, from the Bat’s point of view: that he was naturally trying to borrow his way into the smallest crevice of our window frame; that he really didn’t want to be indoors; that he’d rather sleep right now; that he’s probably petrified and doing his best to cope with the stress. She also talked me through what he needed to happen: that he should be released at dusk, his natural feeding time; that he should be released near mature trees; that he should be released at shoulder height; that we’d need to wear gloves handling him; that we should put him in a cardboard box and leave the cardboard box outside, in the branch of a tree. She reassured me that he was safe where he was now, because the window I’d “caught” him in is north facing and therefore shaded and he wasn’t going to over-heat or de-hydrate. "There must be some means of escape..."
As I wrote this post (something I’ve been meaning to do for a while) I had another snoop around the Bat Conservation Ireland website. Take a look at their Data page. Search under Dublin and Unidentified Bat. I think that’s our little guy: the dot on the part that looks like the eyebrow of a shouting man with a sticking-out nose. Okay, now I really sound like I’ve gone Batty! I know why that is too – I’ve picked up GlenvArgh! again and re-commenced frogging The Behemoth. I’ve yet to figure out if re-attempting this project will benefit my sanity or be to its detriment. It’s the eve (when I started this) of WWKIP and I’ve fallen out with all of my WIPs. I agreed with Caroline / Bootie (blog-free) from our Swords Knit-Nights that I’d join her in a mini-kal for some stranded mittens. I’m doing EZ’s Norwegian Mittens and she’s doing Eunny Jang’s Anomoie (sp?). We agreed to cast-on on Sunday or Monday, which I did… sort of. 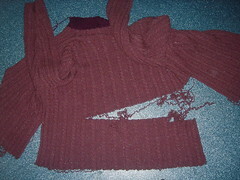 I knit up the i-chord border and started to pick-up stitches and stopped. I need to figure out who I’m knitting these for – me or my dd. I need to figure out some maths if it’s for my dd. I need to be sure of the patterns too. I just need to give these some thought but sitting down and focusing on them is way-down on my priority list. I cast-on some toe-up socks from my new, fabulous, Cat Bordhi book: New Pathways for Sock Knitters. I’m trying the pontoon toe for the first time and not loving it, plus I dropped a stitch, plus the two socks don’t match in their striping at all. I’m tempted to rip back and do the toe from Back to Basics – that was a nice toe – but I’m feeling underpressure time-wise for my SAM5KAL credit. And there I was hoping to knit two pairs of socks in June to try to catch up!!! If I can just find that pesky dropped stitch I think these are my best option for a KIP WIP. So what do you do when you fall out of love with your WIPs? You cast-on for another one, of course. I started a swatch for my long-promised Tomato by Wendy Bernhard from No Sheep for You. If I don’t knit this soon it will be too cold to wear it for another year. I was also unable to get stuck into the Scavenger Hunt organised by TIK. I entered and got the list of challenges last Friday. My first impulse was to go for the big points and get in contact with The North County Leader to be interviewed. However, the cold light of Monday morning struck and faced with school-runs, house-work and a lack of a printer for the flyer (that’s meant to feature in each photograph) I never got going. Instead, I did other Missionary work for the conversion of all to Knitting: the mother of a boy in my dd’s class mentioned that she did some knitting in the past. (In fact, she’s of a very high pedigree in that her mother owned a yarn shop in Edinburgh. I didn’t want to reveal my obsessiveness too early, so I restrained myself from quizzing her up and down about what yarn shop exactly, but I will find out…) Anyway, I admitted to being a knitter and we’ve chatted on and off since about how nice it is. The other day she told me that because of me she felt compelled to take up the needles again and was attempting a scarf but with the only needles she could find: a mis-matched pair. The next time I saw her I gave her the set of plastic needles that I’d bought in Aldi a while back for no better reason than they were for sale. I’d had in the back of my mind to give them to my niece for her birthday but the other part of the back of my mind kept telling me she wouldn’t really appreciate it – not as much as an Averil Lavigne CD, let’s say. This born-again-knitter, on the other, was genuinely thrilled – which gave me a feeling of enormous satisfaction. I’m giving myself a Knitting Scout badge for my efforts: The “Proselytize Knitting” Badge. 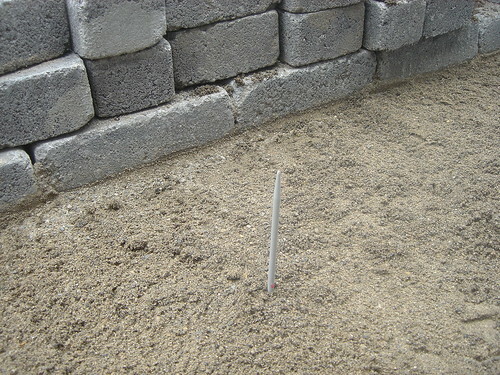 DH more than me has earned the The “MacGyver” Badge (Level Two) for using my metal 4mm double-pointed needle as a depth check when he was putting in the sand blinding for paving he’s doing in our front. In Ireland, saying this is considered a challenge – a threat, a call to arms, a gauntlet being thrown down. And my adversary? It’s the foe of old: Debbie Bliss’s Glenvar – Take II. 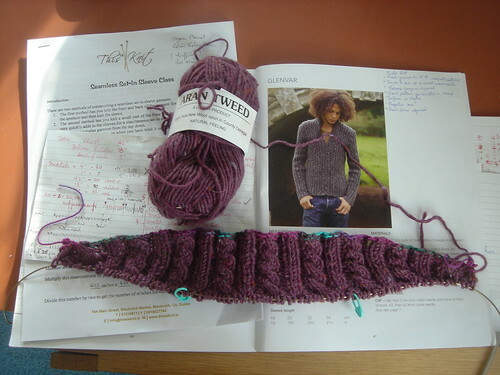 See my notes from Aileen’s “top-down, set-in sleeve class” at This is Knit? Finally, I’m knuckling down. 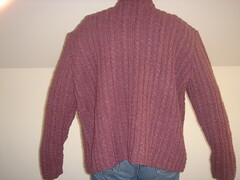 I’ve advanced the back, with the short-row shaping for the sholders – which did funky things to the ribbing. Meanwhile, however, the original – The Behemoth – is languishing in the frog pond. Frogging is harder than I anticipated. I didn’t realise you can’t frog ribbing backwards i.e. from the bottom up. I didn’t want to take the sholders apart until I’d knit the new version down past the armholes – for comparison & reference. So instead I’ve had to find my woven-in ends as a starting point. It’s slow progress but I’ve got three balls wound up and ready to move on again. I’ve definately caught the “startitis” bug lately. 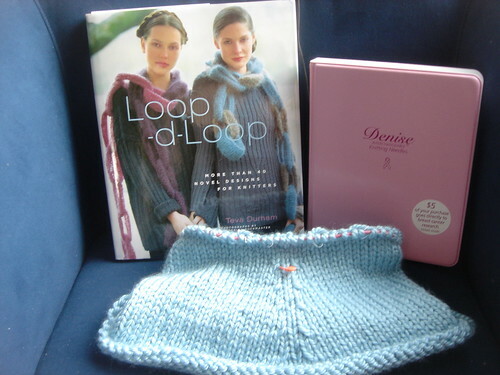 At my last Knit Night I bought Loop-d-loop by Teva Durham from Claire (a.k.a. 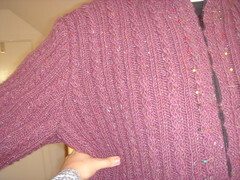 Clarabell on Rav) and almost as soon as I got home I was inspired to cast-on for the Yoke Vest. I had one of those flashes of inspiration when I realised that the yarn I had bought in Lidl, for no better reason than it was ridiculously cheap, would be perfect. I swatched it up and, much to my surprise, I was right. I toyed with re-working the maths because the size of the finished vest in the pattern seem ridulously small – and I’m fairly average sized. 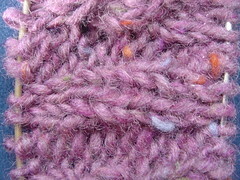 However, there’s a note in the pattern that the yarn is stretchy and the Lidl yarn was too, in the swatch. 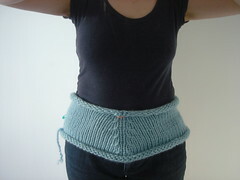 Plus, looking at the photos of others on Ravelry, the people wearing it don’t seem to be much bigger than me. So I stuck to the pattern as written. So far as I understand it that’s a convoluted way of saying “starting with a purl row, work 3 rows stocking st” and I can’t fathom what this talk of creating a balanced loop through the centre st at bottom neck is about. Anyway – knit on through all crises – as the wise lady says, eh? I might have to take the EZ approach and just knit it and see. Often the best strategy, apart from which this one would be a doddle to frog! So here’s the plan Mrs EeeZee (easy! easy!) has helped me to concoct: I will do my own version of the Almanac and start with an Aran in January. But not just any Aran, oh-no! Only THE Aran, the one that broke my heart last August. It began life as 15 balls of Kilcarra in purple last May. Very quickly, I realised an error in my measuring – I used a favourite jumper of DH’s prior to purchase and then measured his chest prior to casting on – and a 16th ball had to purchased. Seven balls travelled with us on holidays in Germany, where the back was almost entirely completed in two weeks. Then, of course, I realised that the balls of substitute yarn I was using had only 80m, whereas I had bought 16 of them thinking they had 88. 16 x 8 = 128, so I was a further 2 balls short. These were quickly purchased. Then, starting to wise up, I did one of the sleeves before doing the second front, to better gauge whether or not yet more wool was needed. Sure enough, I was soon up to 20 balls of wool. Would you believe this 2oth ball ran out, just as I was completing the collar? Yup, you guessed it… yet another ball was needed just to sew it all up. Note the “extra Ease” at the chest – we’re talking at least two sizes too big! And the not-so-great way it hangs on the back? Men have weird shapes, yes?